What Color is My City? 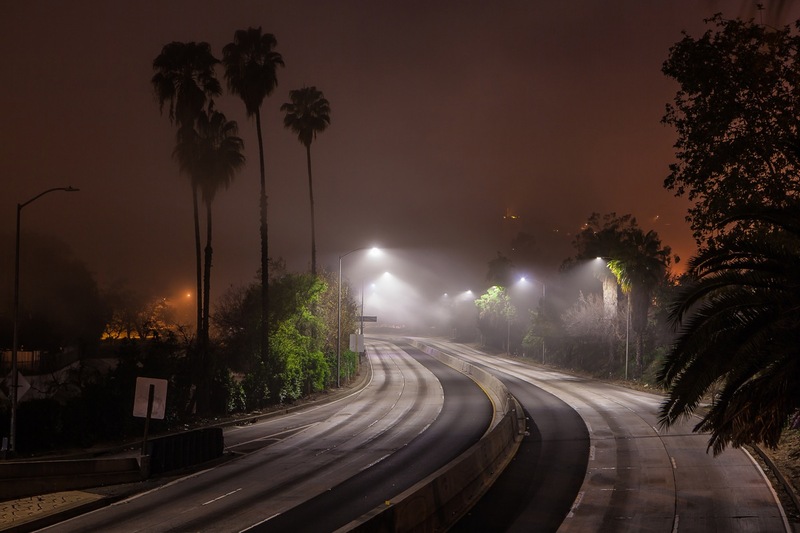 Night lights are changing L.A.’s complexion, by Adam Rogers. When I was old enough to have a car but too young to have anywhere to go, late in the night on weekends my two best friends and I used to drive to downtown Los Angeles. This was in the mid-1980s. The parts of downtown that weren’t Skid Row were as empty as if they’d been neutron-bombed. We were looking for Blade Runner; we got The Omega Man. We’d head for Bunker Hill and Grand Avenue, carving through the middle of what city mapmakers used to call the “central business district.” In the city’s infancy, grandees lived on the hill in Victorian mansions. Twentieth-century business ambitions replanted the landscape with a forest of skyscrapers amid a brutalist-meets-futurist combination of super-wide surface streets, overpasses, underpasses, below-ground malls, and elevated pedestrian paths. My friends and I would park in front of the then-new Museum of Contemporary Art—as sci-fi-looking a building as any Angeleno could have hoped for. The lights suspended above the empty streets gave the whole experience an acid, radioactive glow, bouncing off the smog corralled against the mountains. Other than our voices, there was only silence, which is downright eerie in a city. When we goaded each other into it, one by one we’d walk out into the middle of Grand, and we’d lie down. We were not risk-taking kids, particularly. Honestly, it was probably as safe as lying down in our backyards. We could hear cars coming miles away, and two of us always stood guard. That didn’t matter, though. None of us could manage to stay prone against the asphalt for more than a minute or two. It felt wrong. Streets are not for lying down on. Like all good Angelenos, we had grown up thinking about movies. We watched a lot of them. We went downtown chasing the peculiar authenticity of being in parts of the city we’d seen on screens. The ubiquitous orange hue of the streetlights was part of our actual experience of Los Angeles—and also the experience of the city we shared with anyone who had seen the thousands of TV shows and films set there. Neither of those cities, real or cinematic, exist anymore. Illuminated nighttime Los Angeles is in flux. Today, if I went downtown in the wee hours and laid my head against the Grand Avenue pavement—well, for starters I’d get run over, now that people work and play downtown again. But the last thing I’d see before the Prius crushed me would be a black sky, not an orange one. The glow around me would be bright blue-white. A citywide program, one of the most innovative in the country, is swapping out a half-million streetlight bulbs for the colder, paler glow of light-emitting diodes. In a city with as long-term a relationship with electric light as Los Angeles has had, that’s a striking difference. The color of the city is changing, literally. Not during the day—as writers from Raymond Chandler to Michel Foucault have pointed out, LA’s stark, raving sunlight bleaches color from the wide, flat city. That’s still true. But at night, lights bring color back to LA—in a characteristic, unnatural spectrum. Now that spectrum is changing, which means the city’s identity will be transformed, too. To commemorate the completion of Hoover Dam in 1936, which would provide a surplus of power to booming Los Angeles, a billion-candlepower beacon surrounded by pinwheeling searchlights turned the sky over downtown white. Over the next few years, those same type of searchlights would come to arc and dance in front of movie theaters lining the new cinematic corridor of Hollywood Boulevard, a symbol of local industry and glamour visible from anywhere in the Los Angeles basin. The mid-century city, with neon signage blaring from high buildings, entire skyscrapers awash with light, streets blazing with hundreds of thousands of streetlights, had become something entirely new, unlike any city on Earth. Fighting back darkness over 500 square miles of city isn’t easy—or cheap. “I’ve been here since 1977, since I was 17,” says Ed Ebrahimian, director of LA’s Bureau of Street Lighting. 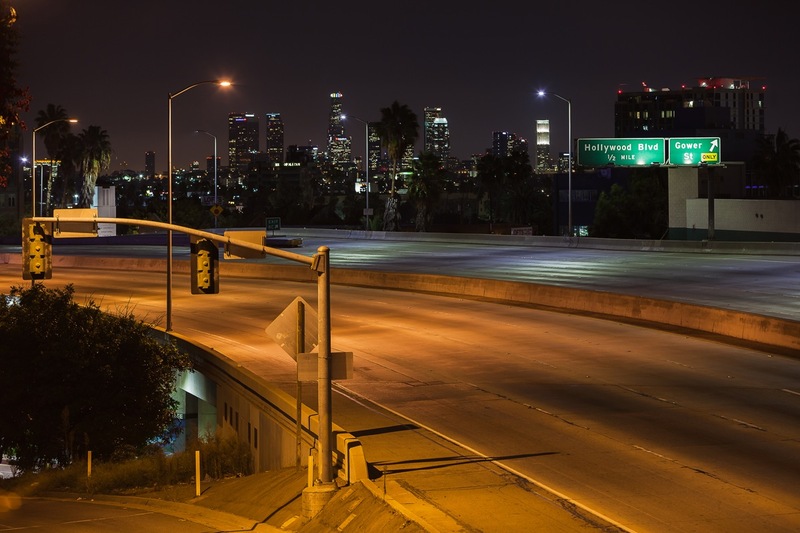 “I’m very aware of what a huge city Los Angeles is, and how many miles of streets and streetlights it has.” (For the record, it’s more than 4,500 miles of lit streets, second only to New York City. )5 By the time Ebrahimian took over the bureau in 2005, the city’s annual bill for streetlight electricity was $16 million a year. In 2008 he pitched a new approach: convert the mostly sodium-vapor bulbs in the “cobrahead” streetlights, tall towers with big, flared-out heads that cantilevered over major thoroughfares, to a relatively new technology: light-emitting diodes, or LEDs. But a light’s spectrum is actually less important than what people see—and believe it or not, those things are different. The color of an object is a combination of the wavelengths of light hitting it, the wavelengths it reflects, and what your eye can actually register. (You don’t see ultraviolet, for example, but some insects do.) What really determines what color you see—and this is the most important part—is how your brain combines all that information with the light and context around it. This dynamic plays out in real life all the time, but the most famous recent instance might be the Internet meme flare-up over a photograph of a dress that appeared blue and brown (or black) to some people and white and gold to others. Passed through Photoshop, the actual pixels that comprised the photographed dress were indeed blue, and the trim was brown. But something about the lighting around it—the time of day it implied, the position of the sun, maybe the suggestion of shade—made the image of the dress polarizing. People saw colors that were really there, but weren’t real, if there can be said to be such a thing as real when it comes to color. Color, if you ask a philosopher, is a big problem. If it arises from a blizzard of photons descending on and then bouncing off an object (and then funneling through the lens of an eye, triggering uncountable biochemical reactions among the pigments and neural connections of the retina, setting off even more biochemistry in the interconnected neurons of the visual cortex), then do objects actually possess intrinsic color at all? For now, put those late-night-dorm-room thoughts aside and light a candle at the altar of neuroscience. The human eye and brain together create an image of the world, in part by doing all that analysis of photon wavelength unconsciously. Lighting can change the color of something as effectively as a coat of paint; that streetlight orange you see in a movie might well be an effect of a gel like Rosco’s “Urban Vapor,” designed to make lights simulate sodium’s glow. But in real life, our brains fight the effect. They try to keep the color of an object constant even as the light around it changes. So LEDs, for example, look white or blue-white to the naked eye. But they often drop the blues or reds at either end of the spectrum. Things that would look yellowish under full-spectrum sun or incandescent light may look white under LEDs. Skin tones look unnatural, even dead. Lighting specialists try to avert those kind of catastrophes by carefully measuring the color of light. One metric they use, the Color Rendering Index, measures the fidelity with which a light reveals the color of an object (the accuracy of CRI is a matter of some controversy).9 A second measure, color temperature, gauges the color of the light itself. Its units are degrees Kelvin, because it calculates what temperature you’d have to heat an idealized object called a black-body radiator so that it would glow the color you were looking for. For example, 4,000K is a sort of bluish white, and 3,000K is more yellowish. Incandescent bulbs tend to register between 2,700K and 3,000K. For Los Angeles’s needs, LED manufacturers pitched Ebrahimian 6,000K—the hard-edged glare of an electronic flashbulb. Los Angeles and lights evolved in parallel. As the city went nonlinear in its expansion—or rather, rectilinear but in every direction until it ran up against the mountains or the Pacific—cars needed lights to follow new routes. Isenstadt, the architecture historian, points out that bright streetlights were perfect for the 1930s and 1940s, when the city wanted to extend shopping hours and connect multiple urban cores.10 Illuminated buildings, neon apartment building signs, and bright movie theater marquees, all aimed at people driving cars, became the defining characteristics of Los Angeles. The proliferation of glaring lights marked, as one book put it, a “victory of symbols-in-space over forms-in-space in the brutal automobile landscape of great distances and high speed.”11 That book was Learning from Las Vegas, and it didn’t come out until 1972. But the lessons that the other pop-up city in a desert teaches were apparent in LA thirty years earlier, had anyone cared to learn them. Artificial lights don’t illuminate everything equally. Brighter nighttime lights leave darker nighttime shadows. They call attention to edges, outlines, themselves. The movies solidified the role of lights in Los Angeles’s mythology. Noirish writers like Chandler and directors like Billy Wilder loved the irony of a city so brightly lit (day and night) hiding horrors in its shadows. By the 1950s, garish neon on screen was a shorthand for harshness and danger. And then there’s Blade Runner. The Los Angeles that director Ridley Scott constructed owed more to Kyoto and Times Square than to LA, though it did absorb the Las Vegas lessons on signage. Flying cars require skyscraper-sized animated billboards, and permanent acid rain refracts a vast plain of yellow-orange street lighting. Somehow Blade Runner managed to frame what LA might become without being much like LA at all, except for the color of the streetlights, which felt right even if the idea of rain in LA now seems more like science fiction than ever. To Conway, the key is that trick the human visual system plays. It’s called color constancy. In essence, it’s the ability of the eye and visual cortex to correct for the color of illumination that’s spilling across a scene and reflecting back to an observer. Most of the time, humans can subtract the “spectral bias” of a source. The lights of Los Angeles are going to keep changing. Now that he has converted the cobraheads along commercial streets, Ebrahimian is targeting the 50,000 or so decorative streetlights in residential areas. He figures the city has 400 different styles. And they need a different color temperature, he says; the bureau is going with the more yellowish-incandescent hue at 3,000K. “It keeps the neighborhood feel,” Ebrahimian says. Because LEDs can essentially be turned into computer chips, it’s easy to attach them to a network. 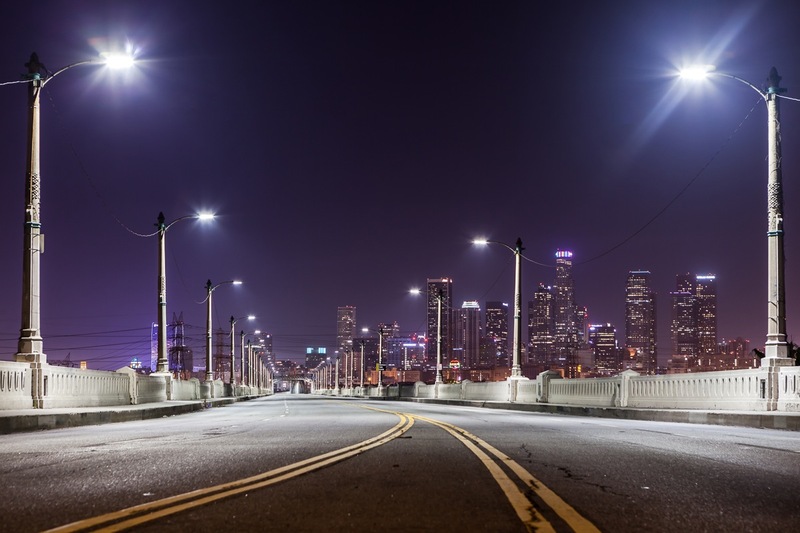 Philips Electronics is working on adding to every cobrahead fixture a wireless connection to the Bureau of Street Lighting. It’s just a little control module that plugs into the light and then sends its status back home, via the Internet, to Ebrahimian’s bureau—on, off, broken, whatever. It won’t let anyone change the color of the light—that would need a different kind of LED—but it will mean that the fixtures will deliver more than just illumination. They’ll deliver information. Maintenance is just the beginning. Streetlights could flash in unison when paramedics barrel down a thoroughfare. You could guide people to certain streets to control entry and egress to a mass event, like a ball game at Dodger Stadium. How about connecting real-time traffic information collected from a phone app like Waze? If that sounds like the exposition that comes before a villainous hacker brings Los Angeles to its knees, well, wait for it. I’m sure that script is already in development. In cities, light defines space. In a way, the placement of every source of artificial illumination encodes a priority of the city. People chose to illuminate this, not that. Artificial light, though, also defines time. “By night, motion is calibrated against an episodic, even flickering visual field rather than the uniform rendering of form that comes with an even wash of daylight,” Isenstadt writes. “By night, Los Angeles is a radiant and reflective construct, no longer beholden to the geometric structure and material resolution of the day.”13 The nighttime downtown where my friends and I lay on the street twenty-five years ago did indeed have a certain radiance and reflectivity. But I don’t remember—or at least I don’t remember remembering—light decoupling from the geometry of buildings and the street grid. The light didn’t just define the city; the city defined the light. Any new memories of the city I form will be literally colored—tinged, maybe—in a new way. Old movies star my city; new ones will feature the city. The same apocalyptic fate that always seems to come to Los Angeles in movies has finally arrived in my orange-lit, neon-bordered version: Fade out. 2 John A. Jackle, City Lights: Illuminating the American Night (Baltimore: The Johns Hopkins University Press, 2001), 73. 3 Lydia DeLyser and Paul Greenstein, “Signs of Significance: Los Angeles and America’s Lit-Sign Landscapes,” Overdrive: LA Constructs the Future, 1940–1990, Wim De Wit and Christopher James Alexander, eds. (Los Angeles: Getty Publications, 2013), 104. 4 John A. Jackle, City Lights: Illuminating the American Night (Baltimore: The Johns Hopkins University Press, 2001), 86. 10 Sandy Isenstadt, “Los Angeles after Dark: The Incandescent City,” Overdrive: LA Constructs the Future, 1940–1990, Wim De Wit and Christopher James Alexander, eds. (Los Angeles: Getty Publications, 2013), 49. 11 Robert Venturi, Denise Scott Brown, and Steven Izenour, Learning from Las Vegas, Revised Edition, (Cambridge: MIT Press, 1977), 119. 13 Sandy Isenstadt, “Los Angeles after Dark: The Incandescent City,” Overdrive: LA Constructs the Future, 1940–1990, Wim De Wit and Christopher James Alexander, eds. (Los Angeles: Getty Publications, 2013), 62.